Why, yes. This is another zucchini recipe. I’m trusting you’ll forgive the repetition as, hopefully, you have these gorgeous squash coming out of your ears as well. I have a basket on my kitchen counter full of them. I keep looking at them and making promises. “You shall not go to waste! Nor you! I shall make something beautiful out of you!” And so. 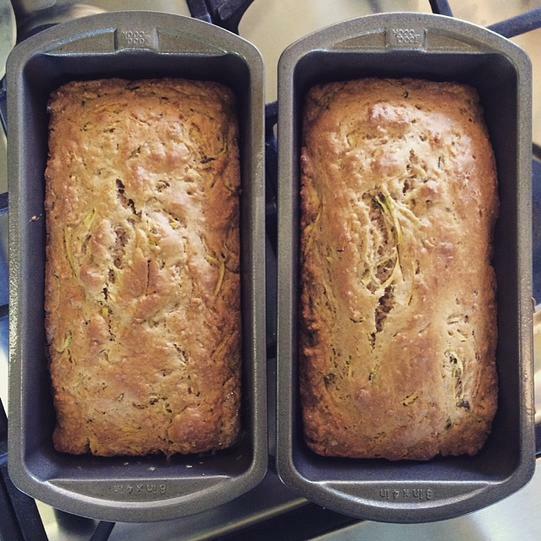 And so: Another zucchini recipe. This recipe calls for four cups of zucchini, so it’s a fantastic way to use up some of the excess. In a large bowl, mix butter, vegetable oil and sugar. Add vanilla, baking soda, baking powder, salt, and eggs and continue mixing until well-combined. You can use a stand mixer, a hand mixer, or a good-old fashioned whisk, as you prefer. Spoon in the yogurt, cocoa powder, zucchini, and chocolate chips until smooth. Add the flour and combine well. (I always save the addition of flour for last so I can adjust the amount if necessary). You can use a 9″x13″ pan for this cake, but I prefer loaf pans as the cake is easier to freeze and save for later. And I’m all about having cake on hand for later. So, whatever your pan preference, spray it well with a cooking spray or grease with butter so the cake will not stick to the sides of the pan. This recipe will make a deep cake in a 9″x13″ pan, or three loaf pans. Bake in a pre-heated oven at 325 degrees for 40-50 minutes or until a knife inserted into the cake comes out clean. Once the cake is baked, set aside and allow to cool. In a medium saucepan over medium-low heat, melt butter, milk, and cocoa power together, stirring frequently. Remove from heat and whisk in powdered sugar until there are no lumps. If you want to pour or drizzle your frosting, do not add as much powder sugar, but if you’d rather smooth or spread the frosting (this is my preference), then feel free to add all, or even more than six cups of powdered sugar.